Teppanyaki plate and induction cooktop on one surface. ILVE’s flagship cooker, Quadra, is now available in a new configuration featuring 120cm double electric ovens, four burners, plus Teppanyaki and induction cooktop, which was first unveiled at EuroCucina in Milan in 2016. This latest version of the classic Quadra freestanding oven has a completely new and never-before-seen cooktop layout and is the first time ILVE has ever incorporated a dedicated Teppanyaki plate, as well as a separate induction cooktop onto the one surface. The Quadra 120cm range is available in three colours – stainless steel, gloss black and bright white. The latest Quadra gives the option of cooking on both induction and gas and the Tepanyaki plate can prepare an array of courses on the plate quickly and easily, from traditional stir fries to seafood banquets to delicate crepes for dessert. All ILVE freestanding ovens also include catalytic self-cleaning, triple glazed glass door for safer and cooler door temperatures and a cool touch athermic door handle. 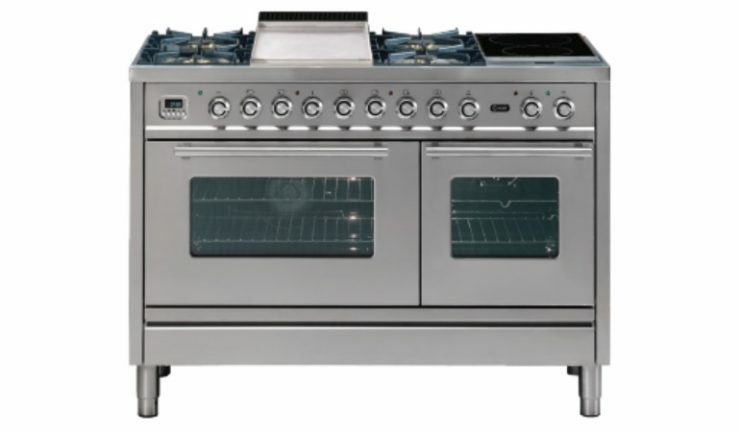 The ILVE Quadra 120cm double electric oven with four burners, Teppanyaki plate and induction cooktop is available for an RRP of $14,999.